When you eat a raspberry it’s hard not to marvel at its delicate architecture—about a hundred little “drupelets,” or self-contained fleshy lobes with tiny seeds perfectly sized to get stuck in your teeth! Their mouth-watering sweet-tart taste isn’t quite as popular in jams and jellies as some other berries, but they are enjoyed around the world. Raspberries (there are many species in the genus Rubus) are genetically related to roses, which won’t come as a surprise to anyone who has brushed up against their prickly, woody canes. The most popular varieties are red, although black, golden and even white (albino) berries are available. Raspberries have historically been used for inflammation of the digestive tract, gum diseases, anemia, stomachache and reducing fever. Tea made from the leaves has been used for centuries as a folk medicine to treat wounds, diarrhea, colic and respiratory diseases. 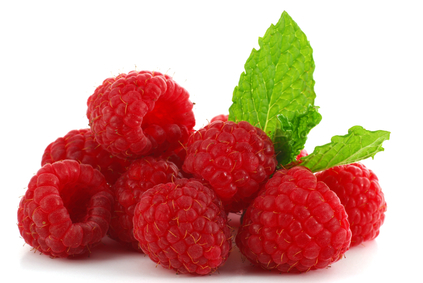 Traditionally, midwives use raspberry for menstrual concerns and to reduce the pain of labour. It alleviates morning sickness, may prevent miscarriage and decreases postpartum bleeding. Early study shows that raspberry leaf may be safe for both mother and child: it is thought to tone the muscles of the uterus to help it work better during labour. (These effects take several weeks to accumulate in your body, so it won’t work to bring on labour if you are overdue.) Labour and giving birth is a tremendous feat of endurance. What the body goes through during the hours it takes to bring a new life into the world is nothing short of a miracle. The physical stress and strain endured by the female body includes free radical damage (inflammation from oxidative stress in the muscle tissue), and the powerful antioxidants in raspberries can help. New evidence in the world of sports medicine suggests that endurance athletes—much like the marathon mothers go through during labour—require significant antioxidant support after exercise. Raspberry extract can help meet that demand, too.